In Austria, the Landtag (state diet) elections were held on 25th of February 2018 in the federal state of Tyrol. 537,273 people were eligible to vote, the turnout was 60 percent. 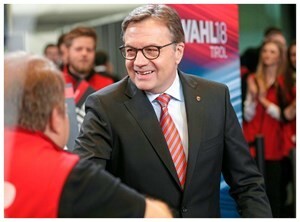 The People’s Party (ÖVP) remains on course for success and the election have brought a significant strengthening of the party under Governor and party chairman Günther Platter. In the election, the ÖVP was able to convince its main voters as well as previous non-voters, resulting in an increase of 4.9 percentage points compared to the previous election in 2013. The conservative party clearly surpassed the 40 percent mark, reaching 44.26 percentage points. Thus, the party wins one mandate and provides 17 of 36 seats in the state parliament (Landtag). The Social Democrats (SPÖ) with top candidate Elisabeth Blanik came with an increase of 3.5 percentage points to 17.25 percent of the votes. This puts the party in second place with six mandates. The Freedom Party (FPÖ) rose the most with 6.2 points and came to 15.53 percentage points. The Greens achieved a minus of 1.9 percentage points (minus one mandate) and could convince 10.67 percent of the voters of themselves. The List Fritz list received 5.46 percent (plus two mandates) of the votes. The liberal NEOS made it with 5.21 percent, respectively two mandates, for the first time in the Tyrolean state parliament. The main election topic of the federal state was the restriction of heavy traffic in the direction of Brenner and Italy. Since 2013, the federal state has been governed by a black-green coalition. Due to the election result, Governor Platter, who is going into his third term, can choose from five coalition partners. 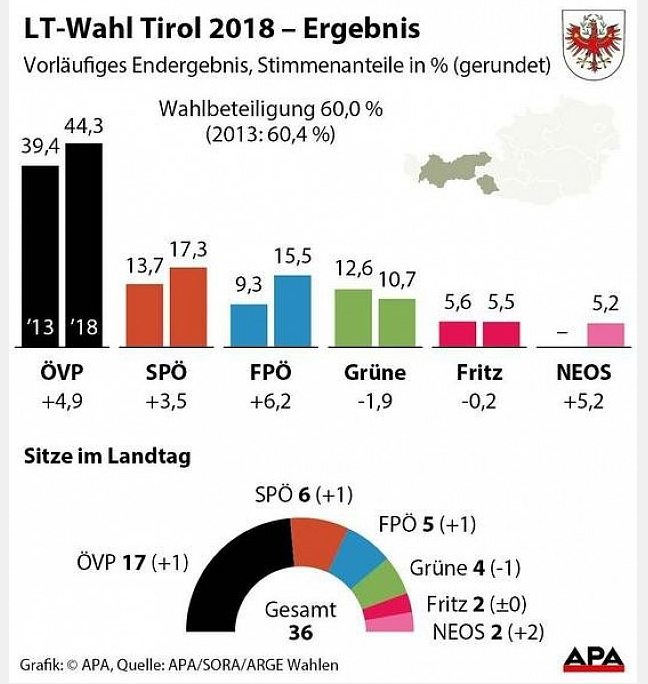 The outcome of the election in Tyrol represents the third victory in a row for the ÖVP after the clear win of the National Council election in October 2017 and the state election in the federal state of Lower Austria.